Discussion in 'Digital Photography' started by SpAtZ, Jun 9, 2006. I do a lot of macro photography with the Canon 100mm f2.8 lens on a 300d. (I will eventually upgrade to a 30d) I am looking for a decent flash to use for macro and some portraits every once and a while. I don't want to spend over $250. Any decent flashes that would fit the price? Don't have firsthand experience, but I think that the E-TTL system from Canon may make life easier. For ABOUT $240 you can have the Canon 430EX Speedlight, you also get a $15 Mail in rebate so it comes to about $225 total. I use this flash for my macro and it works very well. You will also need an off shoe camera cord and flash bracket to get the flash above the front of the lens. I solved that problem years ago by buying a studio strobe setup. It was well worth it. A good light system will outlive many cameras. The neat thing about both macro and portrait is that you have a controlled setup and so you do not need fancy automatic TTL strobes. But what you Do need is the ability to control the light. Control both it direction and hardness/softness and the ratio of main to fill lighting. Main to fill is key in digital because of digital's very limited dynamic range. A used studio power pack system would cost about three times your budget. but before I had this I used a set of very inexppensive Vivitar strobes and Wein "peanut slaves. 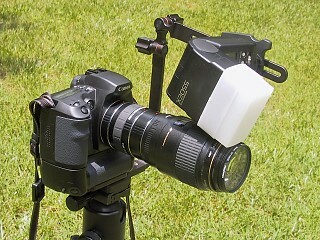 The slaves are little one inch cubes of clear plastic with a "hot shoe" on top and a tripod socket on the bottom. Then I bought an Umbrella and a photoflex "softbox" then get some very cheap tripods to act as light stands. then buy the lowest priced strobe that can be aimed at theceiling and put that one one your camera. This ceiling flash trigger the other two. Total cost for the whole two light setup might be within your budget. Save money by replacing one slave and the on-camera flash with a 15 foot sync cord. With film I used a flash meter to set everyting up but with digital the DSLR's histogram display makes a good meter. The strobe wont help him much for macro if he goes outside and want pics of insects and flowers and such, he will have to bring the subjects inside to his studo.